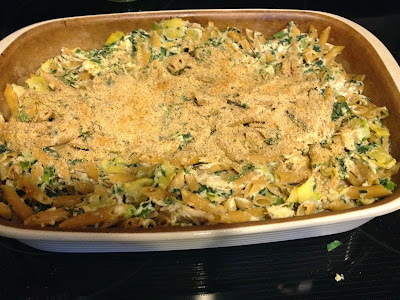 My husband and I love to make spinach and artichoke dip. It makes such a nice appetizer and tastes amazing. Sometimes I wish you could just eat it for dinner! Oh, wait. This is where my hours spent on pinterest come in handy. 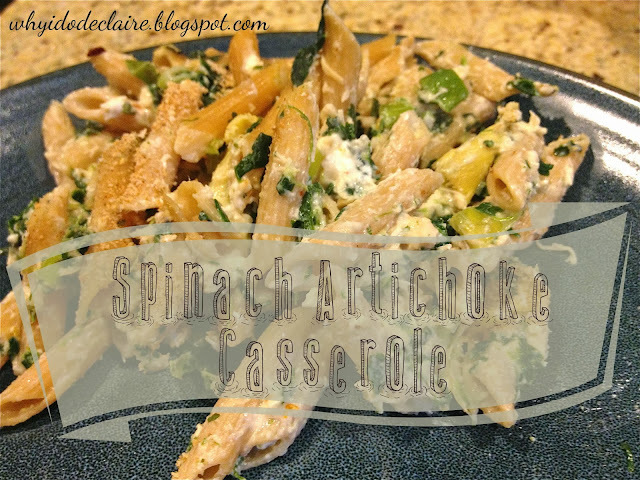 I found a pasta recipe with spinach and artichoke here and altered it to our tastes and to include chicken. It makes a tasty meal with the tastes and cheesy goodness of the original dip. 1. You will need a 16oz (approx.) 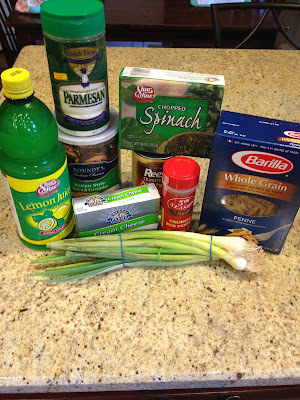 box of pasta (I typically use rotini, but we had penne), 3T. minced garlic, 1c. 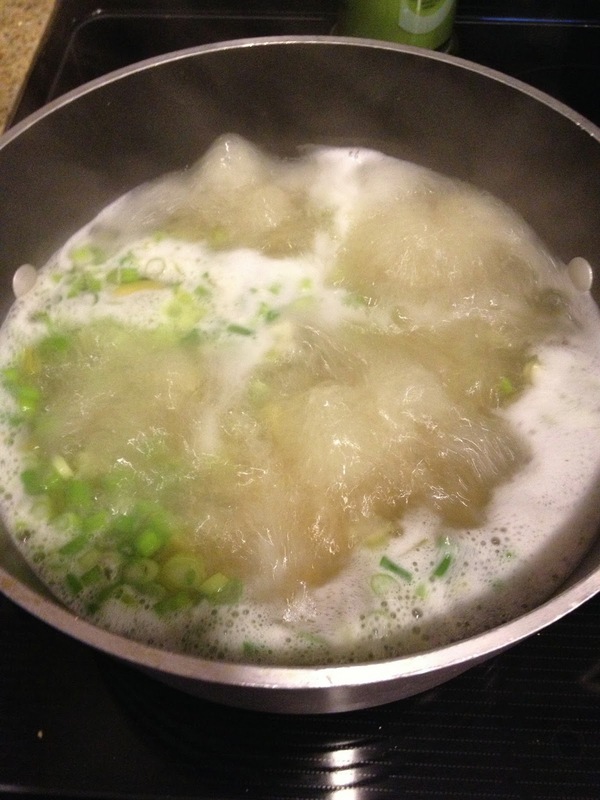 chicken broth, 1 bunch of green onions, chopped, 1lb cooked, cubed chicken breast, 1 10 oz. 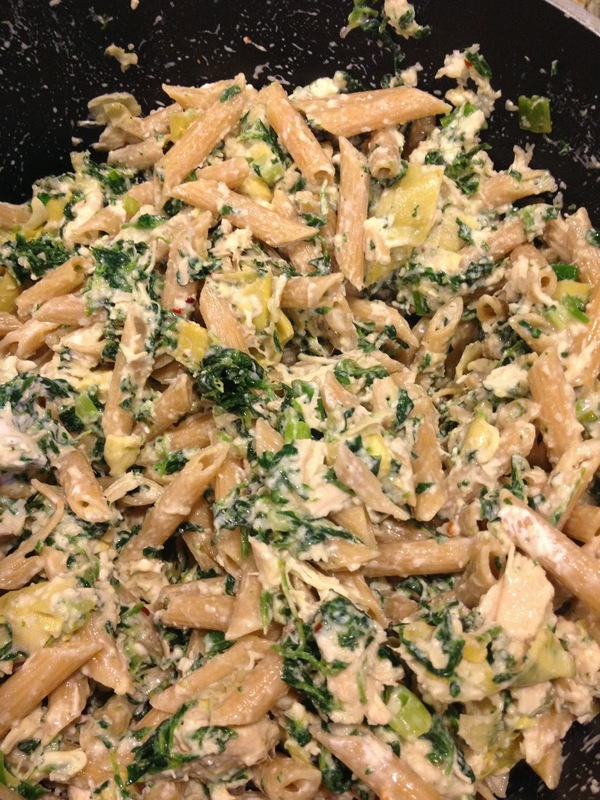 package of frozen spinach (thawed with excess water squeezed out), 1 can of artichokes, drained and chopped, 1c. parmesan cheese, 1 8oz. brick of fat free cream cheese, 1T. lemon juice, 1/2t. red pepper flakes, and 1/4c. seasoned bread crumbs. 2. 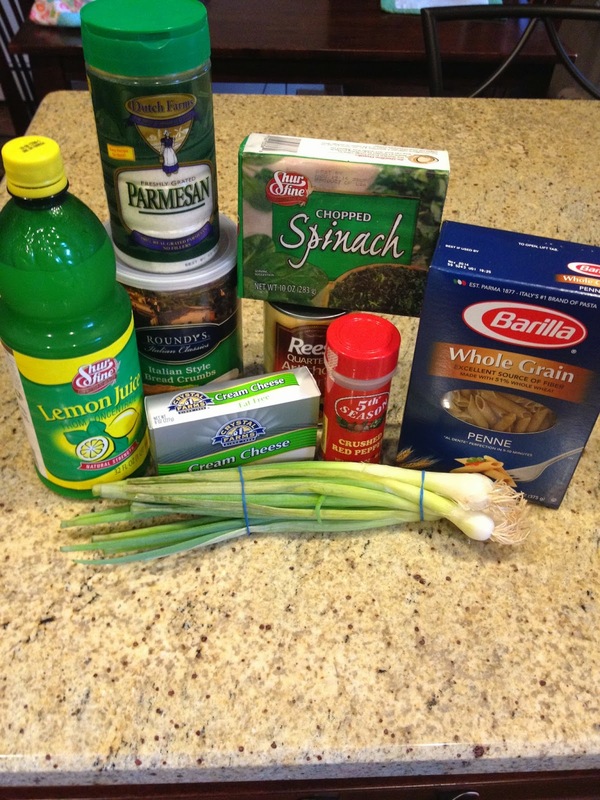 Boil water in a large soup pot and add pasta. Cook 6-8 minutes and add chopped green onions last 1-2 minutes to soften. Drain. Add back to pot (or large bowl, but I prefer to keep the dishes to a minimum). 3. 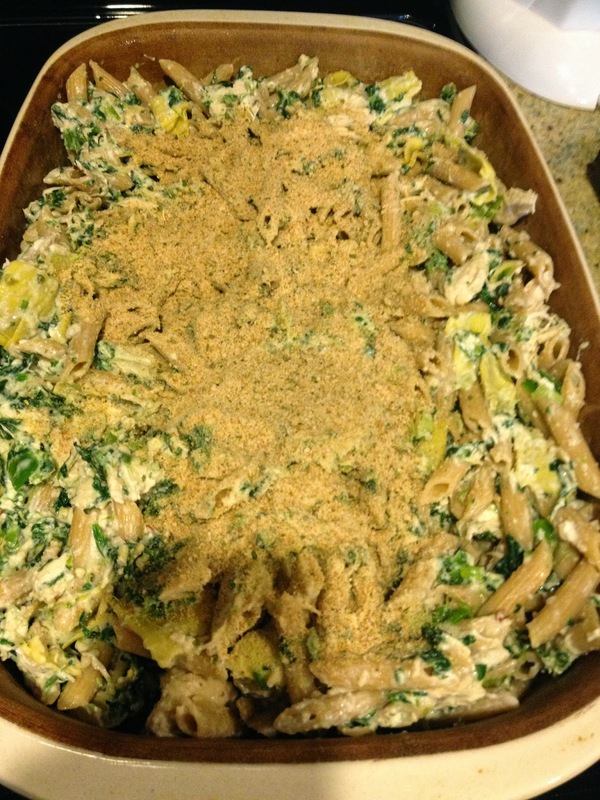 Add remaining ingredients, except bread crumbs. Hot pasta will melt cream cheese. Stir until everything is well incorporated. 4. Once you've mixed everything, place it in a greased casserole pan or 9x13 pan. 5. Sprinkle breadcrumbs over top. Bake 5 minutes at 500F. 1. Preheat oven to 500F. Grease 9x13 or casserole pan. 2. Cook pasta in large pot for 6-8 minutes. Add chopped green onions 1-2 minutes before pasta is done to soften them. 3. Drain pot and add green onions and pasta back to it (or use large bowl). Add remaining ingredients, except seasoned bread crumbs. 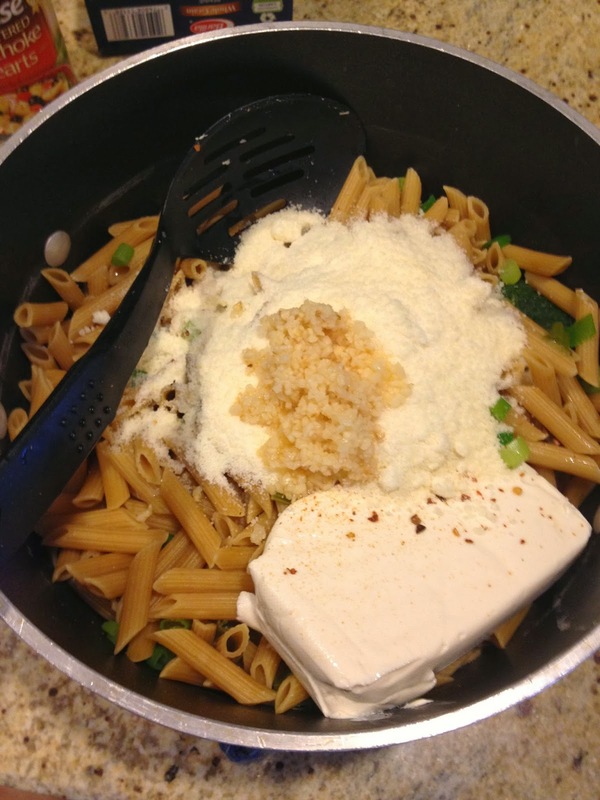 Mix well until cream cheese has melted. Spoon into casserole pan. 4. Bake for 5 minutes until breadcrumbs are golden brown. My husband and I both love spinach artichoke dip, as well, I bet we'd love this! Nom nom nom. You probably will! It's perfect as the weather cools off. OH. MY. GOSH! I am a spinach artichoke dip connoisseur, and always order it wherever we go somewhere that has it. This pasta looks AMAZING. Yep, I'll definitely be making this!! Hope you guys love it!